OROGOLD Cosmetics offers a way for individuals to maintain youthful, healthy skin with the help of the signature gold ingredient which has been used since the time of the Ancient Egyptians. There is another ingredient used as far back as the Bronze Age: henna. Henna is a small flowering tree native to parts of Asia, northern Africa, and Australasia. The dye created from this tree is also called henna. Its use as a dye for skin, leather, fibers, and hair has been around for ages, with documentation from the Roman Empire, Egypt, and Morocco, among others. But the renaissance plant has other uses as well. It has natural anti fungal and insect repellent properties. The flowers of the Henna tree can, and have been used to make perfume. It can also be used to preserve cloth and leather. The most well known and popular use for henna is as a dye, specifically for the skin and hair. In order to turn this plant into a dye for body art and cosmetic tattooing, the leaves are ground into a powder and mixed with water and something acidic, like lemon juice, to create a paste. The leaves contain lawsone, a dye that easily binds to proteins, allowing it to remain on the skin for longer periods of time. After the henna powder is made into a paste, it should be allowed to rest for six to 24 hours. This will give the lawsone enough time to be released from the leaves. Adding essentials oils like tea tree or eucalyptus will also help the henna stain the skin. The henna can be applied to the skin using a paper cone, fingers, or syringe. The longer the stain stays on the skin, the darker it will be. The designs are intricate and elaborate and can be anything from flowers and leaves to symbols and geometric shapes. There are traditional decorations in many cultures for events like weddings or pregnancies. After the henna is applied, it can be steamed or warmed to intensify the color. Eventually the paste will dry and can be easily brushed away. Although henna does not fall into the category of new beauty products, it is experiencing some popularity in the United States. 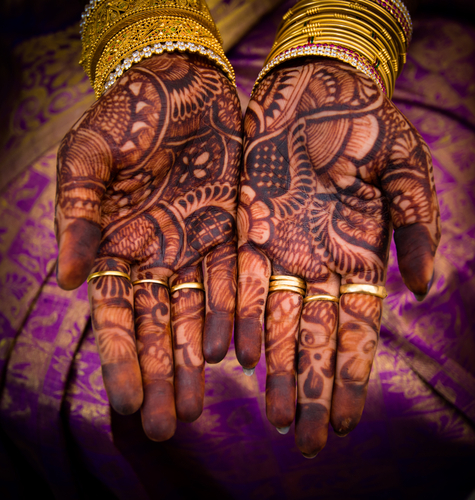 Of course, henna and henna body art is still used in many countries across the world in traditional ceremonies. In the U.S. henna for pregnant women is trending. Now that a lot of women choose to get maternity pictures taken, one way of making the pictures more interesting is to get a henna design on the belly. Henna is also popular as a hair dye. The post henna hair color is completely dependent on the pre henna hair color, but generally is an auburn color with hints of orange to burgundy. Oro Gold professionals appreciates the power of natural ingredients like henna and gold, which is why Oro Gold is committed to continue finding new ways to incorporate these ingredients into their products.